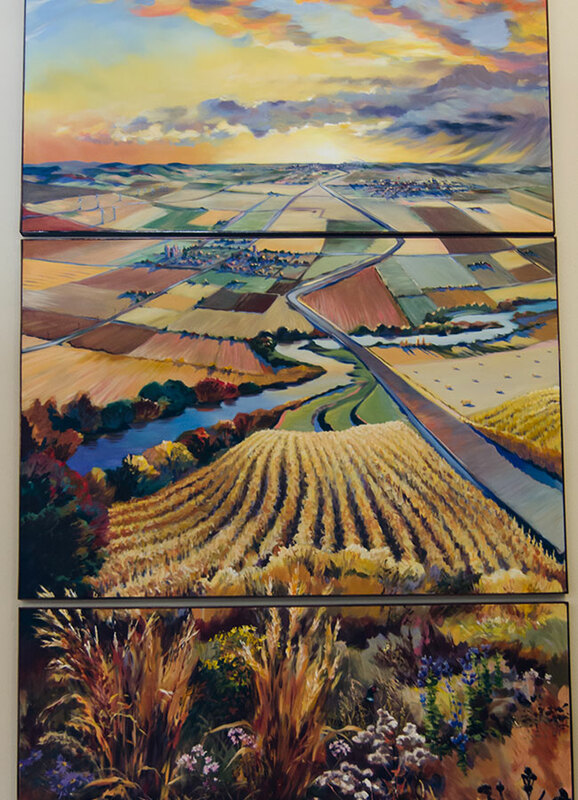 Four canvases unite to create a landscape dominated by a vast cloud-filled midwestern sky. It is greeted at the horizon by a wide open sea of prairie grass—a prairie landscape encountered by the settlers of this region: those who have called this home, have nurtured this fertile soil, cultivated opportunities and adapted to change. 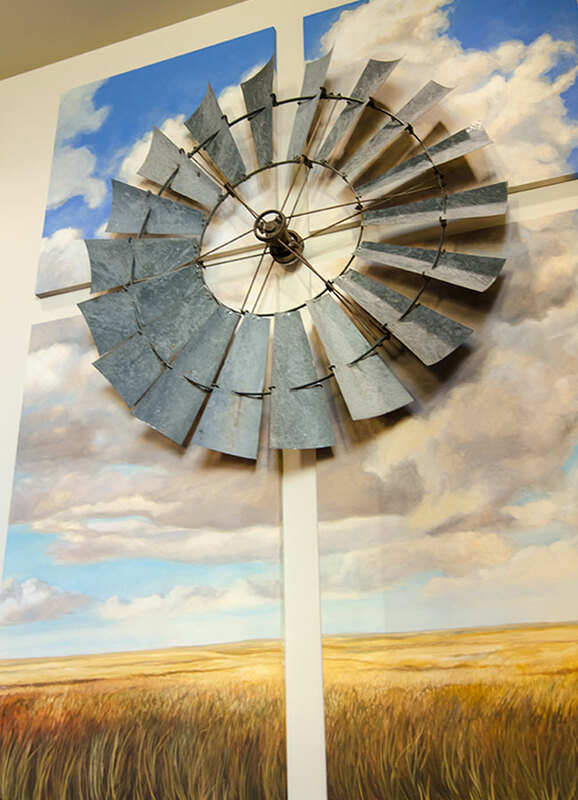 Projecting out from the painting is a vintage windmill wheel-an iconic structure that denotes the heritage of life on the plains. For over a century, nothing has harnessed more of the prairie winds than the farm windmill. The wheel serves as a metaphor for progress. It also represents the hard-working, devoted and faithful people who have made this region their home. 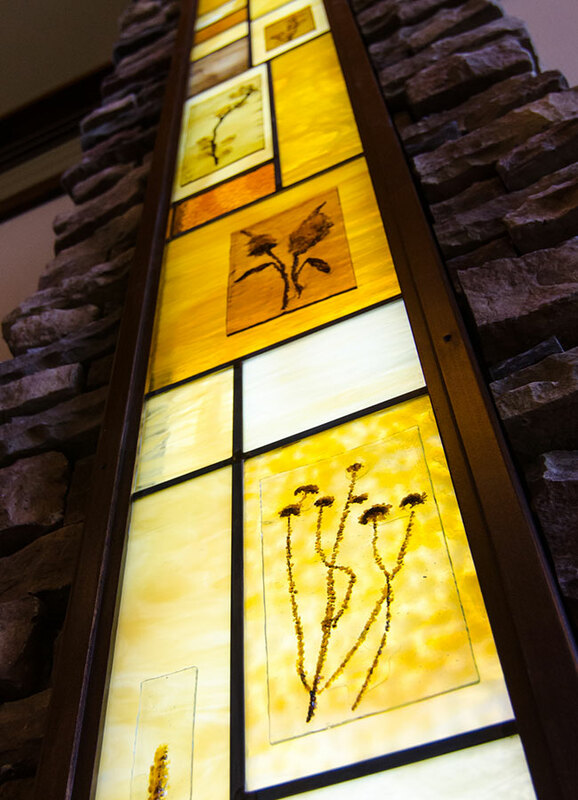 The stained glass panels in the banquet hall pillars were constructed using prairie-themed amber and earth tone glass to create a mellow ambience. Native plants were molded in clay and prepared for a kiln. These impressions were then filled with glass frit—crushed glass—and covered with a separate piece of glass. The finished panels were set into wood frames. A middle layer of cinnamon-swirled glass was inserted, giving the illusion cloudy skies. A third layer of white prismatic was added for light diffusion. The challenge of designing for a specific site ignites Kepp’s creative fires. She loves exploring unique materials to create art with a fresh viewpoint. 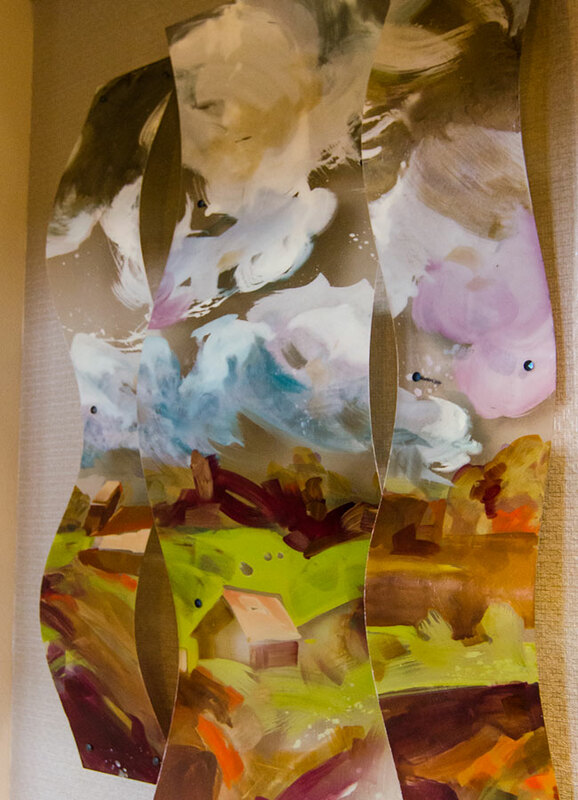 Kristy created a stylized prairie landscape using fiberglass and automotive paint. Transluscent fiberglass provided a tough, flexible surface while appearing light and ethereal. Auto enamel painted on the underside allowed the visible glass fibers to capture the light. Where paint was not applied, “windows” reveal the wall behind, creating shadows that heighten the visual dimension. Once completed, cut, reassembled, and mounted, the floating wave pattern reflects light, creates dimension and adds a bit of sparkle, bringing the art to life. Three paintings form one landscape. It’s late October, and the Iowa prairie is ripe with seeds. In the foreground, we see examples of life-size prairie plants, inviting you to step into the painting. beside a highway, drawing us further into the distance: over a river, harvested fields, round bales, farmyards and an Iowa town. Finally, in the distance, we see wind turbines, loess hills, and a city on the horizon. A rain shower drifts north, revealing the big sky. The setting sun illuminates high clouds with brilliant yellows, oranges, and reds. High-altitude contrails above the clouds lead our imaginations to distant lands. 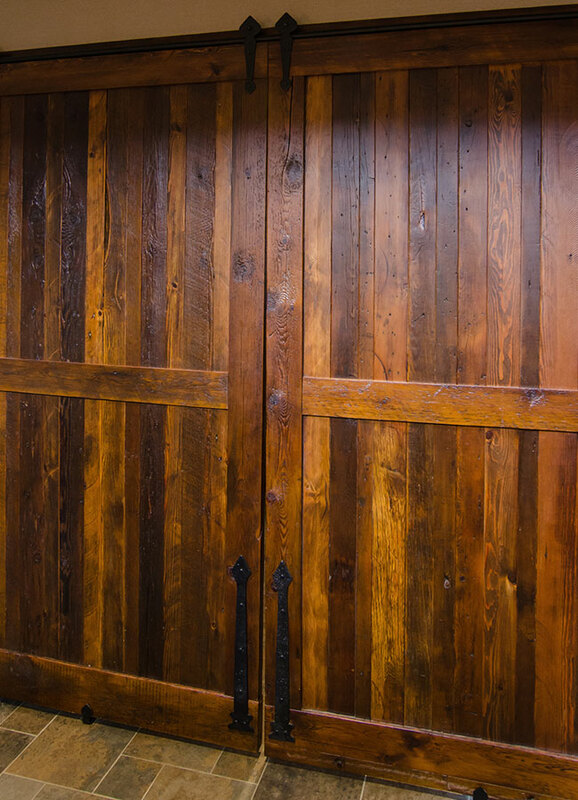 The two large sliding barn doors that separate the event center lobby from the banquet hall were hand crafted from 100 year old Iowa barn wood by Larry “Bub” Korver. The blackened iron hardware including the door hangers and track are vintage recreations. The doors beautiful grain and patina was enhanced by light hand sanding and the application of several layers of natural amber shellac. The inclusion of materials for the prairie’s past are intended to honor the ingenuity and work ethic of the prairie’s early settlers.